cap is up to 25 cm broad, fan-like, smooth, moist, cream to light brown. no stalk-like stem is present. 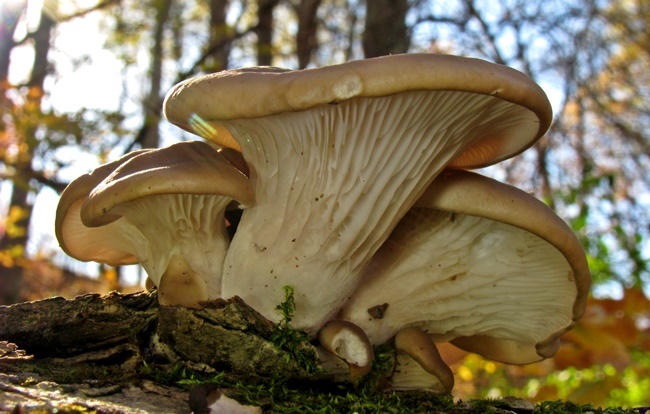 usually grows in large overlapping clusters, on trees, logs and stumps of hardwoods and conifers, never on the ground. gills have smooth (not serrated) edges and are not separable from the rest of the cap. appears in spring and fall. has a mild, pleasant taste and fragrant fruity odor; cook before eating. a potentially poisonous look-alike for kidney patients is the Angel wings mushroom (Pleurocybella porrigens), which is similar in appearance but is ivory white rather than cream, has thinner flesh. do not eat specimens that under 8 cm broad, to avoid confusion with smaller, inedible look-alike species.